← Making Kale Chips: A Real Food Recipe Review — Does it Work? Sun Bleaching Laundry Stains Review – Does it Work? Keeping white laundry bright and stain free is a difficult task – especially when small children are involved. One of the most effective ways to clean whites is with bleach. But bleach is a harsh, toxic, and corrosive chemical that must be handled very carefully in order to keep your family safe. Some mamas who use cloth diapers swear by using the bleaching power of the sun instead. Can the sun naturally and safely remove stains from your white clothing? Saves Money – the sun is free! I think white clothing for children is a baaaaaad idea. With a 3 year old and a 1 year old, messes and stains are a constant part of my life. I’ve learned that a white shirt can be ruined forever within minutes of its first wearing. I have a small collection of white items for my kids; most of it has come as gifts or hand-me-downs. Sometimes I layer them under outer clothing, more often I leave them laying in the drawer. (The same is true for my wardrobe!). It just feels too risky to put them in white! Because we don’t have a lot of whites, there are never enough to do a bleach load. And I’m not sure I really like the idea of using bleach around my kid’s clothing anyway. So my kid’s socks are mud stained, their white necklines and cuffs are dingy, the baby’s bibs are greyed from food stains, the little guy’s undies have the occasional brown streak, and the prefolds we use as catch-all rags have all sorts of random stains on them. Recently I read about using the sun to naturally bleach your whites. This idea was right up my alley! 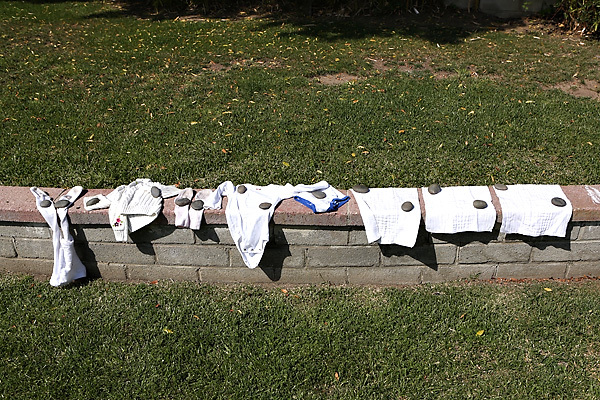 It seems cloth diapering mamas find that drying the diapers in the sun fades away any of the poopy stains that settle into the cloth over time. I collected up all the little kid stains on white I could find and waited for the next sunny weekend (it didn’t take long to arrive in sunny SoCal). I draped the assortment of items across a sunny stone wall in my backyard with stones on the corners so they didn’t blow away. I left them out there most of the afternoon – they probably got 4 hours of strong, direct sunlight. The sun did a great job on handling the more “biological” stains, but with food, dirt, dinge, and paint stains there wasn’t much of a difference, if any at all. Overall, I think sun bleaching is a great idea for cloth diapers, but is generally ineffective against general laundry stains. Have you ever tried bleaching stains in the sun? What was your experience? This entry was posted in Baby and Kids, Cleaning and tagged better for baby, better for the earth, better for you, cleaning, easy, laundry, saves money. Bookmark the permalink. 23 Responses to Sun Bleaching Laundry Stains Review – Does it Work? I’ve also heard that putting lemon juice on diapers and laying them out in the sun will bleach them. I haven’t tried it on our diapers yet, but I’m interested to see if it works. I agree, white + babies = bad idea. Definitely tell me how it goes, Stella! I have never done this with laundry however I do know if you use plastic storage for food and they get stained by say tomatoes, you can set them out in the sun a few hours and they will bleach out. I will have to try the lemon juice and sun combo on some stains I have on some white clothing. Ooooh – I have some tomato stained plastic, and will have to try this out! Thanks for the tip! Sun bleaching is great for general dinginess, and as for the con of sun bleaching breaking down the fibers in your clothing, chlorine bleach will do the same thing. All you have to do is accidentally drip bleach on something and over time you’ll notice that’s the area that will wear out the quickest. It’s true, Becky! My first job was washing dishes and I spilled some industrial bleach on my jeans. There was a hole in that spot after the next washing. Fabric softeners and running clothes through a dryer also break down the fibers of fabric. I have a lot of really cheap tee shirts (the kind that fall a part in a month or two) that I use for work (I work with special needs kids) and I have had some for years simply by air drying them and not using fabric softener on them. I also maintain my nicer shirts the same way. A good steaming or sitting them near my humidifier takes care of any static problems. Great article! I’ll have to try this on the socks my son wore outside in the grass! And I agree! I hated that all the baby stuff was in the light pastels that fade so easily. I started buying darker colors whenever I could because they hid the stains much more easily! I’ve never tried sun bleaching but I do use a clothes line during the summer. It’s in the shade, though. What I have found works WONDERS is washing soda. I use it for any and every stain. When I was living in town, a neighborhood dog attacked me. It bit my face and laid my upper lip open. I used my sweatshirt to stop the bleeding till I could get to the ER. Well, my sweatshirt was soaked. I thought I would never get it clean. It was my favorite one! I tried everything, all the products in the laundry detergent aisle at the grocery store, etc…. Finally I soaked it in washing soda, and taDA! Our dryer stopped working and I’ve been hanging everything outside, not just my cloth diapers… I have found that there are some stains, especially if they have already been washed and dried that are on the clothes for good. More amazing than removing stains is how bright my colored clothes look! If it wasn’t such a pain and things like rain got in the way I would always line dry everything outside in the sun! Nothing smells better than line dried sheets!!! To be honest, I’ve never tried line drying. But just like you said, I’ve heard amazing things about line dried sheets! I have a lot of white clothes and I use hardly any bleach, though I have ro admit that mine are mostly 100% cotton. For blood stains, I use hydrogen peroxide. I soak the stain andlet it sitbfor a while. Bubbles the blood right out. Works best on fresh stains. For all other stains I have a large stainless steel pot. I fill it about half way with water, add a load size scoop of detergent and get it boiling. Then I add the whites and stjr them around good with a large wooden spoon. The heat gets turned down to low. I stir frequently. I have never burned any cloth that way, but there could always be a first time. Once I’ve let this all cook for about an hour or so, I transfer it all into the washr and let it run on a regular cycle. Works wonderful for me. Of course, Ihave to admit that I line dry everything, but often inside the house. IT TOTALLY WORKS! My 7 month old daughter is EBF and her bms are always a little loose…she has ruined countless onsies and some cute shirts with the “up the back blowouts”. All I do is wash like normal in the washer and put the garment outside in the sun to dry…and viola! Clean as new! Sometimes it takes longer than an afternoon in the sun. Sometimes all day or even a couple of days if the biological stain is stubborn. As long as the stained item hasn’t been dried in the dryer, chances are good that you can get the bleaching effect of the sun to assist with stain removal. A repeat treatment of a concentrated solution of laundry detergent rubbed into the spot (not so vigorously that the fibers are abraded) and rinsed well can help, followed by another day of sunshine. Recently the sun got the last of the tomato stain from chili out of a cotton t-shirt. When red wine, muddy splashes, poop, chocolate or blood have left a bit of a mark or shadow in the fabric after using appropriate initial treatment, the sun gets the last vestiges of discolouration to fade out totally. I sun bleach my lo’s diapers and clothes and it works 90+% of the time. The trick is to make sure the item is fairly damp when you put it in the sun. It works best on cotton, but will work on more resistant/quick drying fabrics if you keep them moist. I just spritz with a spray bottle of water. My baby is still pretty young and EBF, so I haven’t had to deal mainly with BM stains. They disappear in the sun. I like that I can bleach her colored clothes without risking ruining them with bleach. My one failure has been with stains from her vitamins (Polyvisol). Those I’ve managed to fade, but not get rid of. I’m surprised that you didn’t get results with food and baby poop – they are the only things I use sun on! I have NEVER bleached my modern cloth nappies and they are white. I also found that sun is great on yellowy to reddish food stains from tomato sauces, stir-fries and curries. Not grease, not banana, not ground in food, but if you’ve washed out the solids/oils and just have a pure stain, the sun works great. If it fades but is still there then put it out for another day or two. I use the sun on stains that I have soaked for days before washing and they really get out things like gravy, blood, carrot, tomato, poop, urine type stains. The sun is particularly good to brighten up whites. With really bad stains, I’ll even leave them in the sun for a couple of days. Persistence pays off. To remove grease you need something absorbent, I find chalk and clays really help and there is something called a “Janie” stick, made in the USA, that you can get grease stains out that haven’t come out in laundering. You can usually brush it off but it can take another launder if some of the “powder” won’t brush out. There’s another plus nobody mentioned: sunlight also acts as a mild disinfectant. Personally, I hate using my clothes dryer. In the summer, I only use it for towels, since the hot sun acts almost like starch (i. e. stiff, harsh towels.) Of course, I have to use it nearly all winter. I say “nearly,” since I live in California’s Central Valley, and there are a few days each winter warm enough to dry laundry. I’ve been using my “solar dryer” aka “clothesline” for over 60 years now. I’ve had to replace it once, since the cordage wore out about 40 years ago. I do this with baby clothes that have food stains and generally have good luck. Just today, ravioli w/red sauce, gone! I tried sun bleaching for my dingiest lightest colored shirts and it worked great! However, I left them out for 5 days, laying flat. However, one shirt has ground in dirt in it from gardening and it still needs some bleaching. I plan to leave it out there for as long as it takes. I also have just put a dingy light-colored pillow case, floor mat, and pillow out in the sun (laying flat). They are my next experiments.